The format I’m used to has completely changed on my tavlet!!! Can’t make heads or tails out of it. Can’t even describe what I’m seeing, or not seeing (no avatar pictures for one thing). Wish I could screenshot the way it as this morning, versus the way it is now. What used to be an easy format has been replaced with something I can’t even vegin to follow. And the size print is microscopic. And the print is not only microscopic , it is soooooo pale, so very, very pale it’s almost discernable from the while background. AND the little quote (“) icon is gone. I was trying to quote something in Karen’s post to a reply of mine, and there is no icon to do that. NOT trying to be negative and I know you have your hands full doing the makeover upgrade stuff, okay? I had similar issues on my android last night. Am on pc now and it is a lot easier. I know, that is not helpful for the users that have primarily tavlets and cell phones. 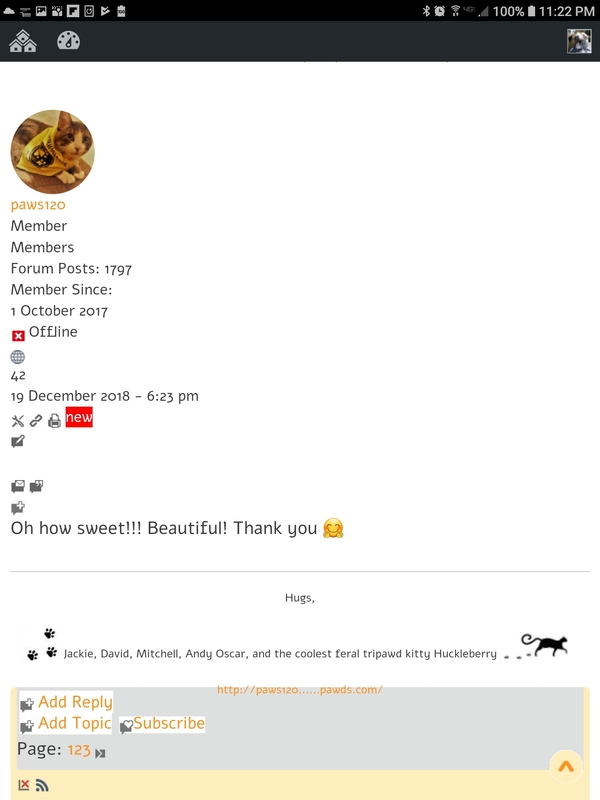 I think admin has plenty of screenshots of the old tripawds. Maybe one from your tavlet here would help him see what you are seeing? Yes, this is temporary, and device/user specific. What you both describe is clearly a caching issue. Your web browsers are loading cached style sheets. Once these are cleared you will notice the forums load and function as expected. We have thoroughly tested the recent updates on both Android and iOS devices. If issues persist, please try using a different web browser. *If you are unable to use the Logout button, visit this link to log out. Had no idea that would be the cause, so sorry. I have not had email issues, notification issues, etc., so I did not follow those steps thinking that they were for other issues. I will log out, clear cache on each device. Thanks. I never had to do all that cache, log out stuff, because everything returned back to “normal” on my big taBlet. The little tavlet never did, but I didn’t bother posting a dollow-up because I could use the big taBlet with the “normal” format. Additionally, Jackie tried all that cache stuff and, if I recall. she said it didn’t work. So, I’m just gonna wait a day or so and see if my big taBlet returns to ‘normal’. Just as long as one of them has the normal format with all the bells and whistles, I’m good! Please give it a try. It will likely solve the problem. Jackie tried all that cache stuff and, if I recall. she said it didn’t work. Had no idea that would be the cause…I will log out, clear cache on each device. While this maybe a tablet/cell phone browser issue, it is not caused by the cache on my end as I clear it daily and the issue (or what I think is the issue) just started happening here today. Nor does logging in and out fix the problem. It happens for me now both using Chrome and Samsung browsers on the tablet. On my LG cell phone it also occurs using Chrome and Opera browsers. So it is not specific to Samsung hardware. I do not have a “computer” to test with. 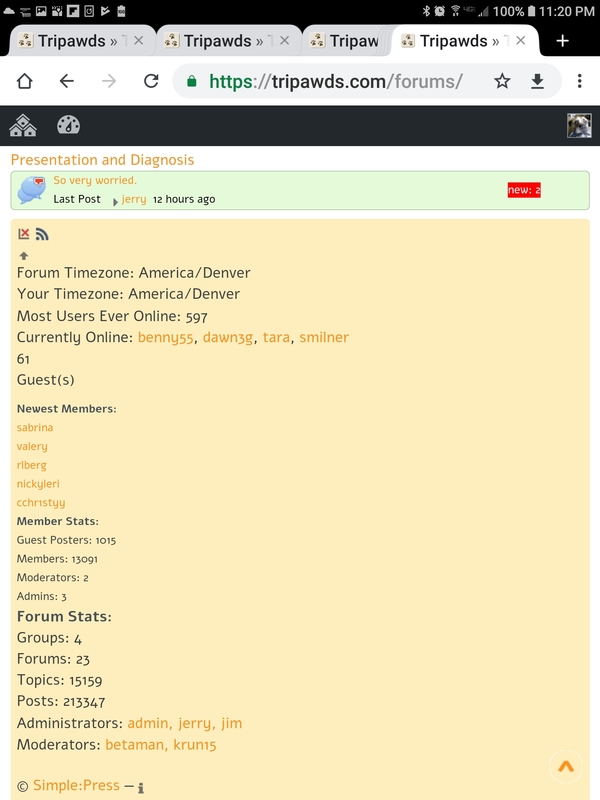 Here is an image of how the forum posts are formatted. It is very difficult to follow threads. I’m making a video of both tablets to help see what we’re dealing with. May take another six hours to upload though!! The picture below is on my big taBlet. Each little …hmmm…block, or segment, or section….takes up the whole screen. And I do have the “size print icon” on smaller. I’ll post screenshots of the little tavlet later. But both are chrome. While this maybe a tablet/cell phone browser issue, it is not caused by the cache on my end…It happens for me now both using Chrome and Samsung browsers on the tablet. Thank you for providing such detail, and screenshot – which does indicate a caching issue, with new stylesheets not loading. Unfortunately, we’re not able to replicate the problem using available browser emulators. Your information will help us investigate further. We understand the broken formatting does make it very difficult to navigate the forums. And we’re working feverishly to get to the bottom of the matter. Thank you for your patience. Each little …hmmm…block, or segment, or section….takes up the whole screen. We understand, thanks for the screenshot. This is the symptoms of current stylesheets failing to load, because cached files and scripts are loading. 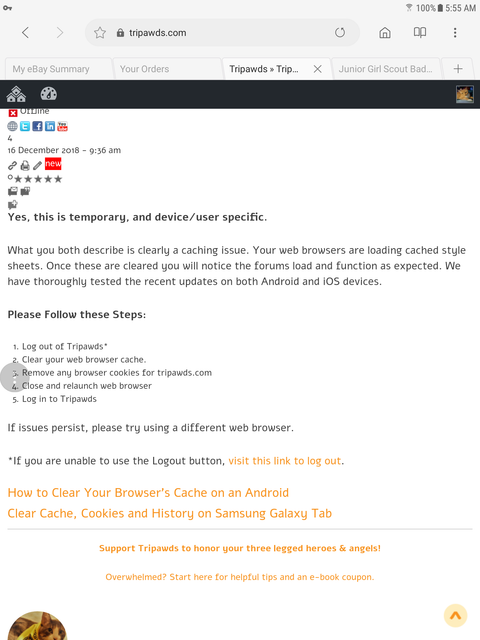 Have you followed the steps to clear browser cache and cookies? This appears to be normal display of the forum footer. Turn the tavlet 90º and those columns should spread apart. Have you also cleared any browser cookies for tripawds.com as recommended? I have not tried another browser or the cache/cookie, only because Jackie had tried it and it didn change things. She told me that in an email…not a post here. But I’ll do it! Makes me break out in a cold sweat though….even with your great directuons!! I DO recall that, I had to switch from Firefox to Chrome (which I use now) awhile back, because one of those “upgrades” didn’t play well with Firefox. I’ll let you know if it changes anything.